Shelah Rawstron gushes about her son, Gavin. He's only a freshman at Oak Hill High School, but he's already quarterback of the football team and a varsity baseball player. Plus, he's smart – always getting A's and B's. "We've been very lucky with that, that he's a studious child," she says. "And takes great pride in performing at his best." But when Gavin's first semester report card came home last fall, those A's and B's had been replaced by “3's” and “4's,” part of a new, proficiency-based grading system. A "3" means that a student is proficient, while a "4" means they have exceeded the standard. When Rawstron first saw those grades, she was concerned. Under this new system, not a single Oak Hill freshman made "high honors," the school honor roll, last fall. That made her wonder if her son would be able to separate himself from his peers. "It was when the final grades came in, and nobody was beyond, it made me go, huh? What's going on? And made me need to ask more questions," Rawstron says. "I had several other parents in the community who turned to me and said, ‘Do you know anything about this? What's going on?’"
Few parents did. 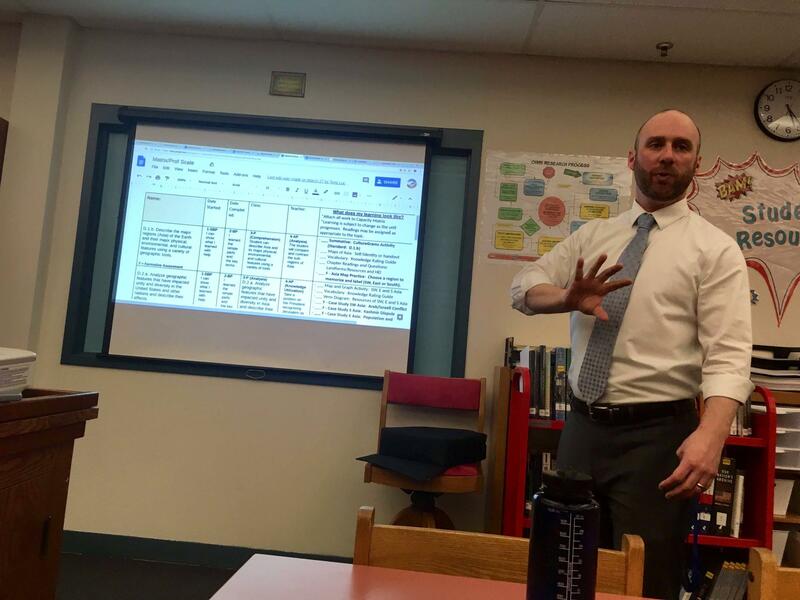 Many were confused, and their concerns grew loud enough that in early April, Oak Hill High School Principal Marco Aliberti asked those parents to meet in the high school library on a chilly Wednesday evening, where he could explain all these new changes. About a dozen parents came to meet with Aliberti. He asks for questions, then launches into a slideshow describing these new grades. "So what is proficiency?" Aliberti begins, pulling up a slide showing the school's grading system. "This is our four-point scale..."
Aliberti, like many administrators in Maine, supports the new, 1-4 grading system. He tells the parents that under the traditional, A-F system, students can still pass a class without understanding a certain subject. He says with this new system, that can't happen. Gaps aren't allowed. "We want to change that paradigm," Aliberti says. "We want to make sure that when our kids leave with an Oak Hill High School diploma, I can say, 'Here is what they know. Here are the standards that they are meeting.' And at what level of proficiency we expect them to meet." But parents have a lot of questions. Some want to know how the grades will affect college admissions. One parent says in this new system, every child could just wind up with similar grades, making it difficult to stand out. "So how are you distinguishing those kids that are in that top ten? Or that top percentage?" she asks. “Or National Honors Society? They work hard for that." Aliberti acknowledges that that is a concern. He says Oak Hill is still working out some bugs and making sure students can exceed standards in every course, so that they may differentiate themselves academically. Aliberti says the school will look at other bugs, too, like the high honor roll that no freshman made last year. "They need to know that we're trying to figure this out the best we can," he says. "And we have their kids' educational needs in mind on a regular basis. That's why we're here." In other districts, though, parents have begun to push back even harder. Last month, dozens of parents from Freeport, Pownal and Durham flooded a school board meeting for their local district, RSU 5. One by one, they told school officials that proficiency-based grading was not working for their children. In response, the district commissioned a survey of teachers and students. It found that at the elementary and middle school levels, the majority were happy with proficiency-based grading and had seen improved standardized test scores. But it was a different story at Freeport High School, where most teachers said the system needed to be fixed. Superintendent Becky Foley says the school has now decided to make a change. "We believe that we need to step back and go back to the 0-100 grading, more of a hybrid approach at the high school level," she says. The new grading system is not mandated as part of the diploma law. But nearly two-thirds of Maine's districts adopted some form of proficiency-based grading. One district that chose to stick with traditional grades was Yarmouth. "We took the emotion out by not jumping on the bandwagon and adding 1-4 grading, and saying that makes our school better," says Yarmouth Superintendent Andrew Dolloff. "I just don't see how that makes your school better." Dolloff says that while the district has made major changes as it's transitioned to "proficiency-based diplomas," he believes keeping traditional grading in place was the right decision. "And because we didn't add in that confusing and emotional piece with the report card, or the diploma, we've had nothing but meaningful, positive conversations with the community about this," Dolloff says. Back in the Oak Hill library at the parent meeting, Aliberti tells parents that his high school is sticking with proficiency-based education – including the new grading system. But he acknowledges the transition is scary. So he tells them to stay involved. Rawstron says she appreciates that openness, but she's not taking any chances. Earlier this year, she called nine different colleges, from Maine to Pennsylvania, and asked them whether her son would have a fair shot at being accepted under the proficiency based grading system. Rawstron says they all told her the same thing – if Oak Hill explains its grading system well, her son will have the same chance as any other student. "And I was really relieved after talking with them," she says. "Because everybody there basically said, 'As long as we have some type of an explanation on how to read [the diploma], then things will be fine.'" As her son's graduation day gets closer, Rawstron says she may wind up back at the high school, peppering staff with more and more questions.